Stuart Blackburn takes the reader inside a little-known form of shadow puppetry in this captivating work about performing the Tamil version of the Ramayana epic. Blackburn describes the skill and physical stamina of the puppeteers in Kerala state in South India as they perform all night for as many as ten weeks during the festival season. The fact that these performances often take place without an audience forms the starting point for Blackburn's discussion—one which explores not only this important epic tale and its performance, but also the broader theoretical issues of text, interpretation, and audience. Blackburn demonstrates how the performers adapt the narrative and add their own commentary to re-create the story from a folk perspective. At a time when the Rama story is used to mobilize political movements in India, the puppeteers' elaborate recitation and commentary presents this controversial tale from another ethical perspective, one that advocates moral reciprocity and balance. While the study of folk narrative has until now focused on tales, tellers, and tellings, this work explores the importance of audience—absent or otherwise. 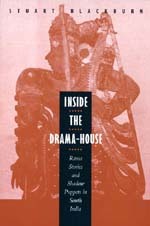 Blackburn's elegant translations of the most dramatic and pivotal sequences of the story enhance our appreciation of this unique example of performance art.